As pollen counts hit their highest level this week, hay fever sufferers are likely to suffer. The Met Office has warned that certain areas in Wales and in the south of England have particularly high counts, and that the levels are set to stay at their current highs for the rest of the week. Despite being lower in Scotland and Northern Ireland, pollen levels are supposed to worsen as the summer continues, forecasters say. Met Office spokesman Grahame Madge said the soaring pollen levels are due to the weather conditions as well as the beginning of the grass season. He said: "It is a combination of factors, partly meteorological - the sort of conditions that contribute to pollen release and spread - and also the fact that we have got the grass season. "Up to now most pollen release has been tree pollen, now we are getting into the grass pollen season in the south and it is very high." He continued: "Some people do suffer with hay fever in extreme ways and those sensitive to pollen need to be aware that pollen levels are very high in some parts of the UK at the moment." According to the Met Office, pollen levels in the north of England are due to continue rising as summer goes on. "As the season progresses more grasses come out and produce pollen," Mr Madge said. 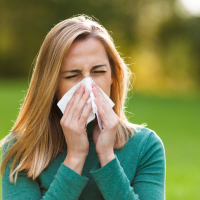 It is estimated that between 10% and 30% of adults and around 40% of children in the UK suffer from hay fever, according to Allergy UK. Symptoms include blocked and runny nose, watery and irritated eyes, swelling around the face and throat, a cough and sneezing. Those who suffer with the condition are advised to avoid alcohol, wear sunglasses outside, keep windows closed, change clothing regularly and shower to remove pollen from hair and skin. Those going abroad with a pre-existing medical condition should get the correct insurance before their trip.